"We need to save these fish for future generations,"
SALMON -- A roadside display of signs and structures underscoring the plight of salmon and steelhead in the Columbia River Basin tie together the two passions of Wil Wilkins: art and fly-fishing. 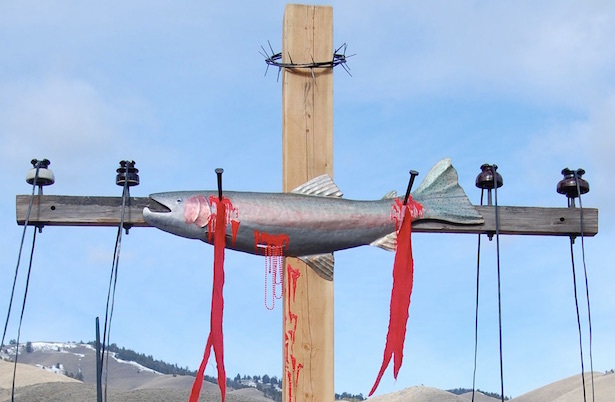 The billboards and sculptures Wilkins erected this year on his property north of Salmon spell out -- literally and symbolically -- his fervent wish to see the removal of dams that challenge migrating salmon and steelhead. Wilkins, a blacksmith whose metal designs have shaped lighting and other architectural elements on upscale homes, lodges and resorts in the U.S. West, said he felt compelled to objectify his concerns after decades of being hooked on fishing. "For a number of years, I've been extracting without giving back," he said. "Then I spoke to a biologist, who encouraged me to educate myself on the issues threatening the fish." Wilkins' protest is directed at the four dams on the lower Snake River in Washington state that are used to generate power and for navigation. Competing interests, including salmon advocates, power companies and farmers, are locked in an ongoing and historic debate about the value of the dams. For Wilkins, the question is settled, giving rise to his artistic and political demonstration. "I'm doing what I can to help raise awareness and the best way to do that is through art," Wilkins said. To do so, he employs words and images to spark interest and discussion. A large sign decorated with an outsized steel fish in high relief argues for removal of the dams and exhorts viewers to "Save our wild steelhead & salmon" while supplying website addresses for advocacy groups. His most provocative piece is a decommissioned power pole crossed by a bleeding fish in a vertical structure that appears to elicit the gestures of cutout figures of a man and a girl. It is the girl that most concerns Wilkins. The child is representative of coming generations and the figure was placed in the sculpture because Wilkins worries about the fishes' fate and whether, in coming years, he will be able to share the joy of fishing for them with his granddaughter, now a toddler. "We need to save these fish for future generations," he said. He predicted greater peril for the fish if those who love them fail to fight for their survival. Wilkins knows his display may trigger opposition in some quarters but that is unlikely to stop him. No one has openly objected to the project on his property but Wilkins is aware not all who see the display are going to agree with his sentiments. The only negative reaction was relayed anecdotally and involved the comment that the signs and structures were "inappropriate," Wilkins said. The artist welcomes the role of agitator for a cause he considers crucial -- and he is not alone. Steven Hatcher, folk and traditional arts director for Idaho Commission on the Arts, said there is a long history of artists making waves in the United States for political, social and economic reasons. Examples range from Latin American wall murals in Los Angeles to the songs about social justice by Woody Guthrie, he said. From Hatcher's vantage point, the power of folk art is its subtlety, creating folk life, which he describes as the art of the everyday performed by everyday people practicing their traditions. "A community performs something over and over again because it contains value and meaning," he said. "The outward expression of value and meaning indicates a deep engagement with a subject. Deep engagement with a subject contributes, for better or for worse, to the beautiful dynamic of the human condition," Hatcher added. Meantime, Wilkins is on a mission. Ultimately, he intends to expand the number of his fish-related artworks, fronting his property with a sculpture garden that just happens to double as a call to ecological care. "It's about art making a statement," he said.